Dare to read out customer reviews first here… So you can have confidence in our work even though we have the LOWEST rate per square foot in the city! Beyer Carpet Cleaning is dedicated to providing you with all your tile and grout cleaning needs with excellence and affordability. Cleaning your grout yourself can be time consuming at best and a disaster at worst. 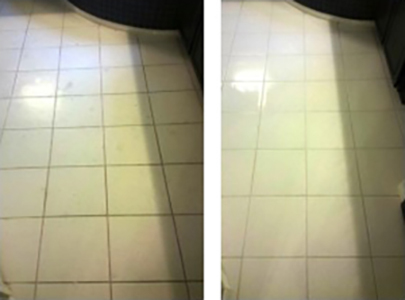 We strive to take the worry out of tile and grout cleaning by using a professional process defined by scrubbing and extracting the dirt with steam, cleaning solutions, and powerful vacuums. 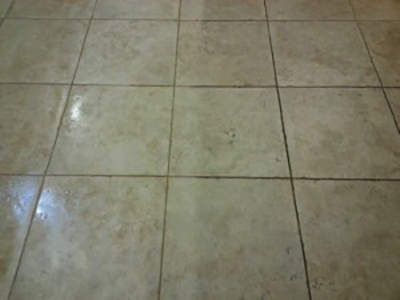 Tile and grout cleaning San Antonio companies are very few and far between to come by that can do the job correctly. 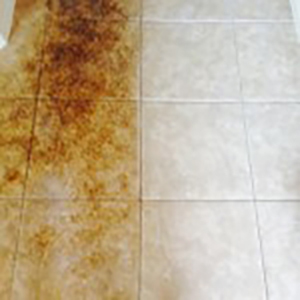 We use alkaline scrubs and / or safe acid scrub washing depending on the tile and grouts condition as a pre – treatment for our tile grout cleaning in san antonio. 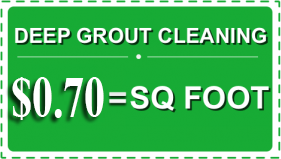 We also use up to 1000 psi of 210 degree plus TILE AND GROUT SPECIFIC CLEANING MACHINE with hot water to blast and extract out the soil, stains and grease. 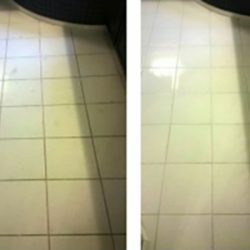 Tile and Grout Cleaners in San Antonio that try to use a portable machine CAN NOT achieve this level of grout restoration or cleanliness with out the proper chemicals and equipment, so don’t be fooled. Do your homework and ask what process is used if you decide to shop around. If a company that does tile grout cleaning in San Antonio, claims they can achieve a 100% turn around, or promising those type of results…It’s Not true. 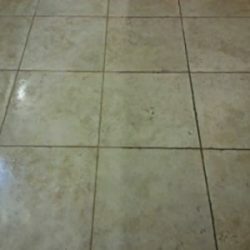 Realistically if your grout has not been cleaned in the past 2-5 years you can expect about a 90% improvement (unless the tile and grout was sealed when the home was bought, in brand new condition.) In that case you could see a 100% improvement. If you are between 6-10 years without getting a professional scrub and clean, you are more likely to see a 80%- 85% improvement. Many People ask us about sealing grout. There are 2 small areas in almost every home that could have some benefit for the use of grout sealant: in front of the stove (protect against grease) and in front of the fridge (common spill or drip area.) 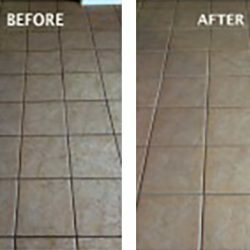 On the other hand We also do not recommend, as an ideal practice, to seal all of your tile and grout after a cleaning UNLESS, you have achieved a 95% improvement or better (essentially flawless.) The biggest reason is, that sealing in imperfections definitely means they are going to stay right where they are. Remember, NEVER Seal dirty grout, you are only sealing filth in if you do, and attempting to clean out dirt, and grime that has been sealed in, will be nearly impossible. We Recommend, if you get your grout professionally cleaned every once every 18 months, and stay on top of it, Sealing will be a quite unnecessary, and would be beneficial only to the next pro that comes to clean. It’s important to realize that just because your grout has been sealed, does not mean it will not get dirty again. You will Still need to have it cleaned regularly regardless. Yes those nice pretty cleaned grout lines will Most definitely get filthy again even when sealed. We tell our customers the things our competitors won’t. Getting our customers to spend extra money on “upsells” is not our style. Neither is charging the rates our competition does, We want you to be able to get a great cleaning without breaking the bank to get there. So, Since you’re here already, might as well choose Beyer Carpet Cleaning who is fully equipped to take on any tile or grout cleaning task. Especially since on average we cost 30% less than almost all legitimate competitors. For your tile and grout cleaning San Antonio, call Beyer at 210-723-4392 now! 5810 Avalon Terrace 78239.